BrainCheck provides mobile neurocognitive testing and brain health solutions for patients and providers. Their solution is the result of 20 years’ research conducted at the Eagleman Laboratory for Perception and Action at the Baylor College of Medicine. BrainCheck’s mission is to help physicians deliver the highest quality, person-centered cognitive care, and to help people of all ages understand what’s happening in their brain. Their solution is a computerized cognitive assessment aid, a prescription device that uses an individual’s scores on a battery of cognitive tasks to provide an interpretation of their current level of cognitive function. It leverages advances in brain science and portable computing to collect data relative to the brain's performance, taking a snapshot of the brain's function at that time. BrainCheck's solution is used by over 100 healthcare and athletic organizations around the US. And more than 40,000 individuals are using BrainCheck to assess and monitor their cognitive health and share changes with clinicians. To learn more, go to braincheck.com. BrainCheck’s infrastructure was underutilized and outmoded, impacting time to market for new features. AWS Well-Architected Review, DevOps (CI/CD pipeline, including auto-deploy to iOS App Store), containers, infrastructure automation. Challenge: BrainCheck’s infrastructure was underutilized and outmoded, impacting time to market for new features. BrainCheck needed a modernized infrastructure with improved utilization and scalability in a secure, HIPAA-compliant environment. They wanted to optimize their time to market, which was adversely impacted by a broken continuous integration/continuous delivery (CI/CD) pipeline. Manual processes were slowing their delivery of new deployments, apps, and feature sets. They needed to automate build and test, and better manage deployments and notifications. AWS turned to nClouds, an AWS Well-Architected Partner and Premier Consulting Partner in the AWS Partner Network, to collaborate with BrainCheck in an AWS Well-Architected Review based on a set of architectural best practices for reviewing critical workloads running on Amazon Web Services (AWS). The Review revealed opportunities for infrastructure improvement including security, scalability, HIPAA compliance, and optimized time to market. After the Review, BrainCheck opted to partner with nClouds to remediate these issues. Amazon CloudFront - A large-scale, global, and feature-rich CDN that provides BrainCheck with secure, scalable and intelligently integrated application delivery. 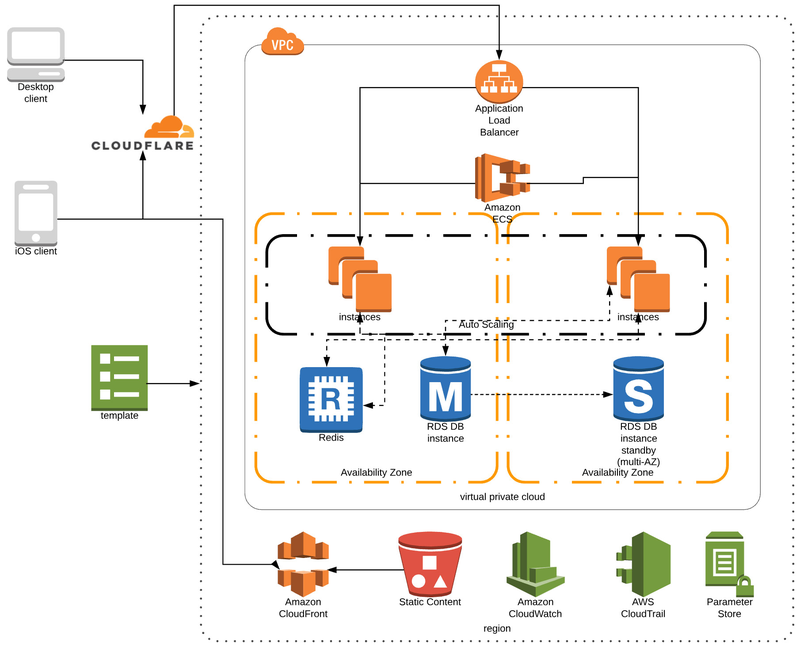 Amazon CloudWatch - Monitors applications, responds to system-wide performance changes, optimizes resource utilization, and provides a unified view of operational health. Amazon ElastiCache for Redis - An in-memory data structure service to enhance the ease-of-use and power of Redis, and improve availability, reliability, scalability, security, and performance. Amazon Elastic Container Registry (ECR) - A fully-managed Docker container registry integrated with Amazon ECS, to host images in a highly available and scalable architecture and reliably deploy containers for BrainCheck’s applications. Amazon Elastic Container Service (Amazon ECS) - Enables BrainCheck to run and scale containerized applications on AWS easily. Amazon Relational Database Service (Amazon RDS) - Enables BrainCheck to easily set up, operate, and scale a relational database in the cloud. Amazon Route 53 - A highly available and scalable cloud Domain Name System (DNS) web service, to provide a reliable and cost-effective way to route BrainCheck’s end users to Internet applications. AWS Application Load Balancer - Integrated with Amazon ECS in each private subnet to support content-based routing and applications that run in containers. AWS Auto Scaling and Scaling groups - Monitors BrainCheck's applications and automatically adjusts capacity to maintain steady, predictable performance at the lowest possible cost. AWS CloudFormation - AWS CloudFormation - Allows BrainCheck to treat its infrastructure as code, to automate operations and bring up new environments. AWS CloudTrail - For governance, compliance, operational auditing, and risk auditing of the AWS account. AWS Systems Manager Parameter Store - Provides BrainCheck with secure, hierarchical storage for configuration data management and secrets management. BrainCheck's solution stack includes additional tools and services (see Solution Architecture description). The AWS Well-Architected Review that nClouds performed with BrainCheck revealed architecture remediations that could be implemented to drive best practices in CI/CD. Following the Review, BrainCheck asked nClouds to perform the remediations. A Well-Architected infrastructure enables faster updates and decreased time to market. Previously, BrainCheck had no CI/CD deployment pipeline -- they used manual processes to do refreshes. The new architecture has a localized container environment for more flexible development and faster delivery of new features. nClouds collaborated with BrainCheck to implement a CI/CD deployment pipeline with automation to enable rapid testing, and spinning up and spinning down features. Travis CI automatically builds and tests code changes and manages deployments and notifications. Unity (using XCode as a mediator) pushes the BrainCheck app to the iOS App Store. AWS CloudFormation automates operations and brings up new environments. Fastlane automates development and release workflow. nOps provides workflow and automation to identify and manage cost and compliance of BrainCheck’s AWS resources. Consistent with guidelines from the AWS Well-Architected Framework, BrainCheck’s infrastructure now employs best practices in reliability and security. A reliable system should have a well-planned foundation and monitoring in place, with scalability to handle changes in demand or requirements. nClouds worked with BrainCheck to improve the scalability of their architecture by including several services: AWS Auto Scaling (to automatically adjust capacity to maintain steady, predictable performance at the lowest possible cost), Amazon CloudWatch (to monitor and respond to system-wide performance changes), Amazon ECS (to run and scale containerized applications on AWS), and Amazon RDS (to set up, operate, and scale a relational database in the cloud). A secure system has an architecture that protects data and systems, controls access, and responds automatically to security events. The new architecture includes AWS Systems Manager Parameter Store (for secure, hierarchical storage for configuration data management and secrets management). Two AWS services were implemented to support both scalability and security: Amazon CloudFront (a CDN to provide secure, scalable and intelligently integrated application delivery) and Amazon ElastiCache for Redis (an in-memory data structure service to improve availability, reliability, scalability, security, and performance). BrainCheck’s new infrastructure improved security and compliance by enabling MFA on the root; implementing life cycle, MFA, and password policies for all users; and disabling or removing all inactive keys. AWS Systems Manager Parameter Store provides secure, hierarchical storage for configuration data management and secrets management. With a localized container environment and automation, BrainCheck has more flexible deployment and can deliver new features faster. Their new CI/CD deployment pipeline enables rapid testing, spin up and spin down. BrainCheck can now quickly go from ideating new features, to creating, testing, and merging into their code to ultimately deliver new features. Automation has cut deployment time to the iOS App Store from 3 hours to 4-5 minutes. BrainCheck’s architecture now has best practices reliability, with improved scalability to handle changes in demand or requirements. AWS Application Load Balancer is integrated with Amazon ECS to manage workloads and support content-based routing and applications that run in containers. AWS Auto Scaling between the instances in Availability Zone #2 and Amazon RDS in Availability Zone #1 automatically adjusts capacity to maintain steady, predictable performance at the lowest possible cost. Amazon CloudWatch responds to system-wide performance changes, optimizes resource utilization, and provides a unified view of operational health. CloudCar optimizes its infrastructure 24/7 with the help of nClouds.. Faster innovation with confidence: culture, CI/CD & containers helped Prodea achieve 10x faster product delivery on AWS..
nClouds enables Alation to develop and test new features using a cost-effective, flexible test infrastructure..